AMD vient de glisser que ses prochains GPU Polaris vont permettre de faire baisser le ticket d’entrée pour la VR. Dans les recommandations minimales pour la VR, il est fait état d’un besoin minimale d’une GTX 970 ou d’une R9 290…c’est ce qu’il faut pour faire tourner l’Oculus Rift à 90FPS en résolution 2K. Now I would like to address a different challenge for us – and that is what is called a Total Available Market. One of the issues we have is the minimum spec for the PCs which will run the Occulus and the HTC headset ant 90 fps and 2k resolution. Now to do that you need either a Radeon 290x or the GTX 970 both of which retail for $349. 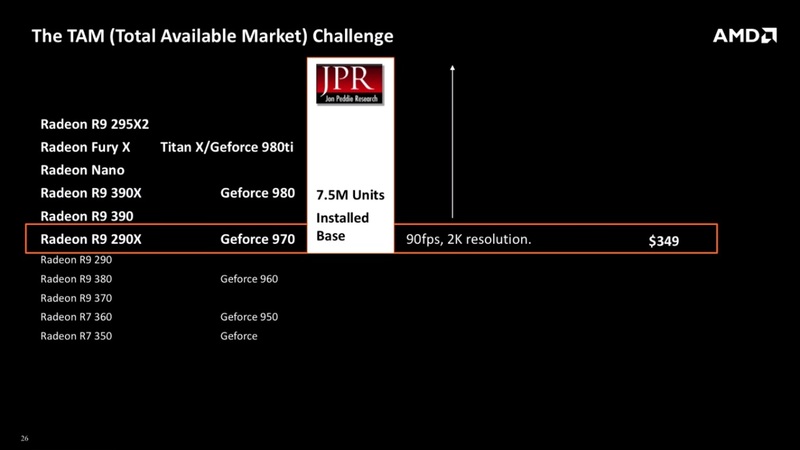 The challenge that we have is if you look at the total numbers of these GPUs that have been sold, according to JPR, that’s an install base of just 7.5 Million units. Now that’s an issue because it means you can only sell 7.5 Million of anything – because that’s the number that can run those headsets. I am very pleased to tell you that we have invented something called Polaris which we think will address this problem. Pour Wccftech les premières cartes polaris disposant des performances minimales pour la VR pourraient se retrouver aux alentours des 250$.